Please visit our fabulous sponsor this week, SLS Lines, to see all of their wonderful products! 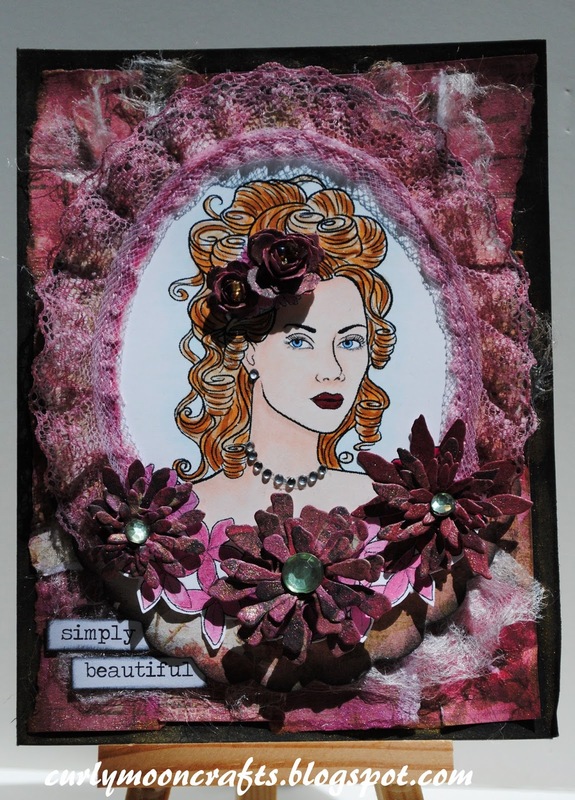 My creation for this week is called Simply Beautiful and uses Classical Lady with Flowers in Hair digital stamp. I printed the digital image onto smooth white card-stock and colored it with various Copic markers. 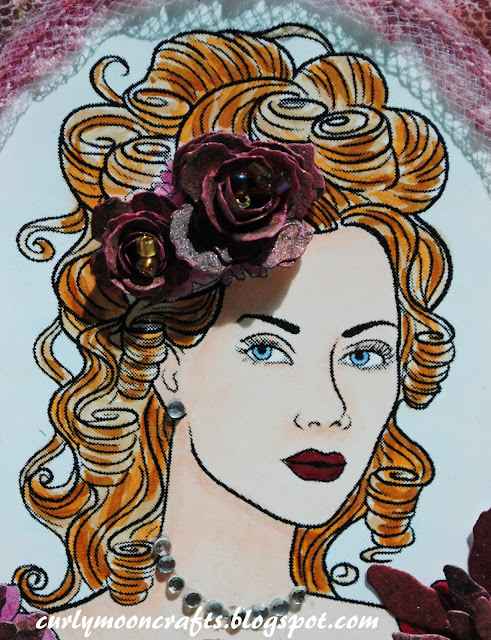 I cut the upper part of the image into an oval shape and attached some lace that was colored with Tattered Rose Distress Stain. I cut some flowers from Prima papers using the Tiny Tattered Florals dies and colored them with pink/red colors of Glimmer Mists, then attached them over some of the floral designs in the image. I added gems and beads to the flowers, then added "jewelry" gems to her neck and ear. This panel was glued to an oval diecut from the same Prima papers. The black card base is covered with torn strips of the Prima papers colored with Glimmer Mists, with strips of "gauze" on top (this is actually left-over dryer sheets that I have torn and frayed - it's a great way to upcycle them! lol) . The image panel is attached with foam dots to the card base. To finish, I added the Chit Chat stickers that were edged with Black Soot Distress Ink. This looks amazing,Patti.Just love those extra special finishing touches to the image.Gorgeous!